Net.Sync is a rack mounted PTP appliance (configurable as Master or Slave PTP clock) that is capable to monitor the synchronization quality of the network executing frequency/phase wander measurements in order to track the accuracy of master clock. 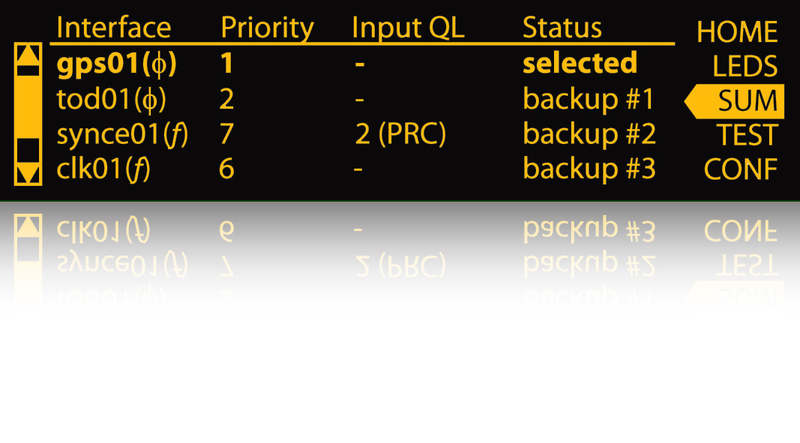 Net.Sync can also be configured to troubleshoot the transmission layer by means of capacity and quality test suites or simply a reflector to loop back packets to remote appliances. AT.NSYNC.SE Synchronous Ethernet clock emulation. ESMC generation and analysis. Synchronous Ethernet clock reference input and output. Frequency offset generation and measurement in Ethernet interface. AT.NSYNC.SEW Synchronous Ethernet wander test. Advanced Ethernet frequency (MHz), frequency offset (ppm) and frequency drift (ppm/s) measurement. TIE, MTIE and TDEV measurement. Sinusoidal wander generation function. AT.NSYNC.MSTR Multistream test. Generation over eight independent traffic streams. Eight analysis filters for each test port. AT.NSYNC.1564 eSAM (ITU-T Y.1564) Test of up to 8 services simultaneously. Set up of CIR, EIR and policing rate. Per stream quality objectives. Measurement of Information Rate (IR), Frame Transfer Delay (FTD), Frame Delay Variation (FDV), Frame Loss Ratio (FLR) and Availability. AT.NSYNC.WIRE Cable test. Wiremap with open and short circuit detection. Measurement of distance to fault. Crossover / straight cable detection. Measurement of cable skew. AT.NSYNC.NS Network Search. Automatic detection of up to 16 most frequent streams listed by Ipv4, VLAN and MAC. 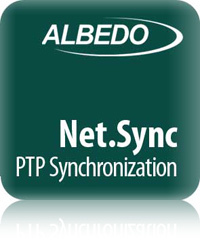 AT.NSYNC.DC Adds redundant -48 V DC power input in ALBEDO Net.Sync. DC connector included. AT.NSYNC.AC Adds redundant 220 V / 50 to 60 Hz AC power input in ALBEDO Net.Sync. AC power cord included. AT.NSYNC.CERT Certificate of calibration. Accuracy calibration certificate, executed only when is sold and before its shipment. AT.NSYNC.CHECK Periodic Unit Verification. Includes board test verification (Calibration, Internal Frequency), port verification (Electric Ethernet, SFP, unbalanced , balanced and analog verification: line attenuation, jitter error, pulse mask).